For satisfactory performance under fire, the U.S. Army awards front-line units the Combat Infantryman Badge (CIB) or the Combat Medical Badge (CMB). Army support units now receive the Combat Action Badge (CAB). The Navy and Marines award the Combat Action Ribbon (CAR). Army Air Forces received the Air Medal for five combat missions in World War II. KIA and DOW casualties receive the Purple Heart, a high military honor, or the first or another Oak Leaf Cluster on it if they have already received the award. Durinng World War II being KIA and DOW also meant the U.S. armed forces automatically awarded you the Bronze Star, generally one-step higher of a medal than the Purple Heart. Since that last, great war, most Medal of Honor (MOH) recipients have been KIA. Being KIA or DOW does not automatically mean the member of the U.S. armed forces receives the MOH, our nation's highest military honor. However, a March 15, 2007, Boston Globe article claimed, "New Hampshire lawmakers are considering a plan to create a New Hampshire Medal of Honor for military members killed in action..."  Moreover, like militaries, societies honor their KIA and DOW as heroes. Many societies, both past and present, view those KIA as heroes, and they generally use the terms KIA and DOW, indeed all terms for war deaths, interchangeably. Terms such as "ultimate price" or "ultimate sacrifice" or "the fallen" also commonly describe deaths in battle. Socieities, including the USA, set aside days of remembrance for their militaries and combat dead, and they build memorials and cenotaphs in honor of their fallen. Whereas USAKIA benefits families of the official DOD determination of KIA and DOW casualty status, societies in general hold ceremonies for all war deaths. The families of those who die in combat, especially their next-of-kin, sometimes receive preferential treatment such as military honors, exemption from taxes, and financial awards. National militaries also distinguish those killed in action with ceremonies and awards. 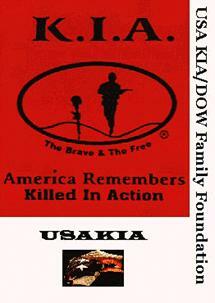 Many groups including USAKIA aim to bring respect back into Memorial Day. The National Moment of Remembrance, backed by a bipartisan group chartered by Congress, asks Americans to honor their fallen at 3PM local time on the last Monday in May, the day the United States of America currently honors its KIA. Memorial Day previously occurred on May 30, and some, such as the Veterans of Foreign Wars (VFW) and Sons of Union Veterans of the Civil War (SUVCW), also advocate returning to this fixed date. The VFW stated in a 2002 Memorial Day Address, "Changing the date merely to create three-day weekends has undermined the very meaning of the day. No doubt, this has contributed greatly to the general public's nonchalant observance of Memorial Day." Since 1998, Hawaii's Senator Daniel Inouye, a veteran of World War II, has repeatedly introduced measures to return Memorial Day to its traditional day of May 30. Common sense indicates that the side with the most losses in military operations loses the conflict: It's kill or be killed, a clear and present danger. However, cases exist where the opposite happens. The Civil War provides one example of where the victorious side had more battle dead than the losing side. Abraham Lincoln's and the U.S. government's policy to reunite the country provided one major reason the victors had more battle dead in the Civil War. Likewise, a smaller force can sometimes beat a larger one; Cannae (216 BC) provides a classic example. However, the idea that when you have less enemies to fight you have a greater chance to win provides one reason for a policy of maiming or killing enemy forces, and another classic Greek battle, the Battle of Thermopylae (480 BC), shows why armies maim and kill and how a smaller army can do a lot. A recent movie, 300, depicts the famous battle where 300 Spartans held off the Persian Empire and forces with far superior numbers, saving Greece. Plato also talks about KIA in his book, The Republic. For example, he has his character Socrates ask Adeimantus rhetorically, "[W]hen a man dies gloriously in war shall we not say, in the first place, that he is of the golden race?" (Book V, Ch. 468-469) Adeimantus replying in agreement says, "To be sure." See the entire text of The Republic here courtesy MIT. DOW (Died Of [Battle] Wounds): Is different than KIA because the casualty survived to reach a medical treatment facility. Military historians use this term more than DWRIA. e.g. See poem "Died of Wounds" by Siegfried Sassoon or references to the term in the National Archives. DWRIA (Died of Wounds Received in Action): Term used by NATO instead of DOW. * The Free Dictionary by Farlex: "Acronym Finder allows users to decipher acronyms..."
* Nolo Press Source of Law on "Homicide"
Please Provide Feedback to Improve Article for Families of Killed in Action and Died of Wounds. * Photo or Graphic in the Public Domain + Photo or Graphic Used by Permission of Grunt's Military Web Site.